Whether it stinks like rotten eggs or bleach, smelly water might have you worried. The exact cause of water odors can be challenging to determine. Therefore, we have created a handy guide to help you identify and treat common causes of household water smells. Chlorine is used by most public water suppliers to prevent bacterial growth. When added to a well (via shock chlorination) or plumbing system, chlorine produces a strong bleach odor. The best way to eliminate the smell is turn on your faucets (preferably outdoors) and let the water run until the smell is gone. In some cases, chlorine interacts with organic materials that have accumulated in your plumbing system, which increase the musty-bleach smell. If you get your water from a well, we recommend having your water system flushed. If your water comes from a public water supply, you should contact your water supply authority. Generally, a sewage-like or rotten egg odor in your tap water results when sulfur-reducing bacteria grow in your drain, water heater, or well. These bacteria, which use sulfur as an energy source, chemically change the natural sulfates in water into hydrogen sulfide-which emits a distinct rotten egg odor. Tap Score includes an option for home testing of sulfur-reducing bacteria. This is the most common cause for these types of odors. When organic matter (hair, soap, food waste etc.) accumulate in the drain, bacteria can thrive and produce gas that smells like rotten eggs. Making sure bacteria growth in the drain is the issue: Ensure that you notice a smell from one faucet when both the cold and hot water smell, and that the smell is not coming out of all faucets. Then, fill a glass with water from the faucet that does smell and step away from the sink so you can't smell any residual odor from the tap. Swirl water inside the glass a few times. Wait 30 seconds–and if the glass no longer smells, then this test suggests you likely have bacteria in the drain causing the smell. Steps to take if test if step 1 indicates the issue is bacteria growth: If the water in the glass does not have an odor, the best plan of action is to disinfect and flush the drain. When hot water goes unused, bacteria in your water heater can produce a rotten egg or sewage-like smell. This occurs if your water heater is turned off for a significant amount of time or if the thermostat on the heater is set too low. These bacteria are generally not a health threat. Making sure bacteria growth in the water heater is the issue: Confirming that your hot water smells, but your cold water does not. This generally means that the smell originates from the magnesium heating rod in your hot water tank. Steps to take if step 1 indicates the issue is bacteria growth: Call a plumber to replace your magnesium heating rod with an alternative, like an aluminum rod. 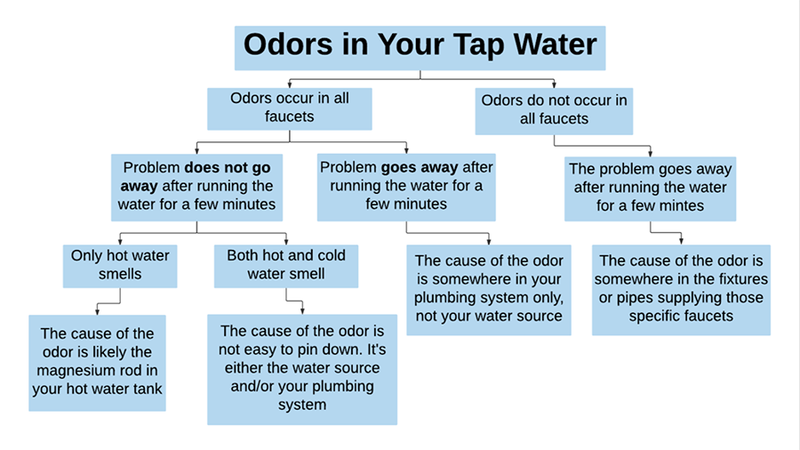 If none of the above steps lead to an answer, the odor may be from your water source itself. If this is the case, do not use or drink the water until you confirm the issue because it may contain harmful bacteria. Treating your well with shock chlorination because the natural chemistry of your groundwater may be supporting bacterial growth. Contacting your local health department in case a defective or improperly located septic system is located near your property. Try to identify if your water source has been switched or if algal blooms have affected your water system’s water supply. This is the most common cause for moldy smelling water. The best way to combat decaying matter in your drain is to disinfect, clean, and flush your drain. Moldy water can be attributed to certain types of algae, fungi, or bacteria growing in your water supply–particularly during warm weather. We recommend treating your well with shock chlorination. If the problem persists, you may want to install an activated carbon filter or an automatic chlorinator (followed by an activated carbon filter). If you are on a public water supply, certain types of bacteria may grow in your supply line if an insufficient amount of chlorine is added. If you suspect this is the case, contact your water supply authority.